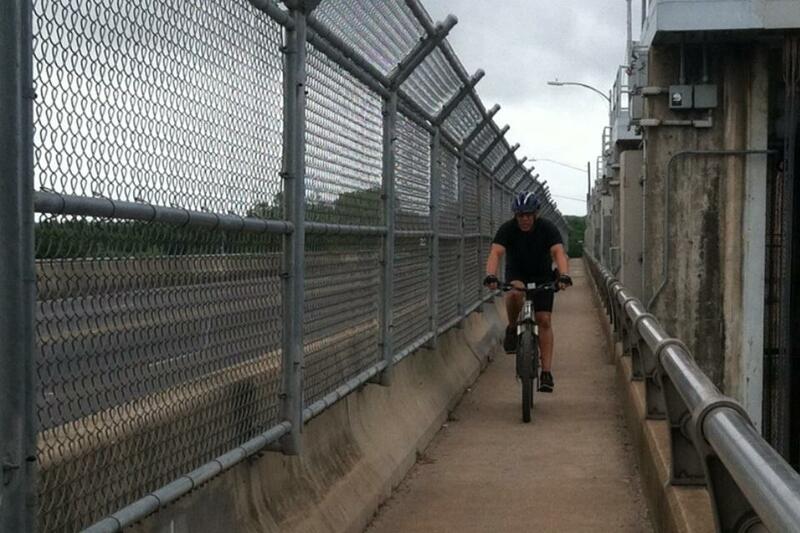 A cyclist crosses the Longhorn Dam on the narrow western sidewalk that links the north and south lake trails. It's a safe bet that the new boardwalk opening along Austin's Lady Bird Lake will attract throngs of people. It’s a sleek, modern, structure. At about 14 feet wide and around a mile long, it provides plenty of space for joggers, cyclists, and people who want to take in a view of the city. But if those people walk east, intent on realizing the boardwalk's promise of closing the loop of trails around the lake, they will find themselves at the Pleasant Valley Bridge over the Longhorn Dam– a river crossing that is neither sleek nor modern. For years city officials have considered it potentially unsafe, and worry it could become more so with added foot traffic from the boardwalk. So far efforts to improve the crossing have failed. The new boardwalk along Lady Bird Lake will lead people to the narrow bridge crossing. People who use the bridge frequently call it a notoriously tricky crossing. The generally spacious hike and bike trail narrows to around four feet on its western sidewalk. Cyclists and pedestrians squeeze past each other with a chain link fence on one side, a three foot tall railing and water on the other. “If there’s a runner, I’ve had it happen before. They wait for me to come through on my bike and then they keep running.” says Lydia Palazzolo, who crosses at least once a day. “I’ll just go as fast as I can, so I can cross the bridge before I see somebody else," says Paul Wilson, whose work brings him over the bridge multiple times a day. A few years ago the city installed signs along the bridge to encourage cyclists to use the road. Research showed the signs were ineffective, and they were taken down after the city got complaints from motorists. 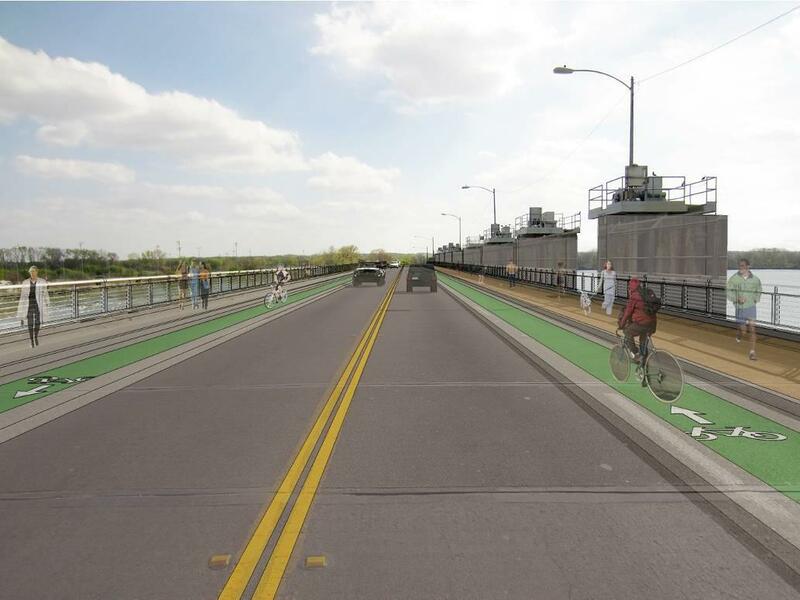 A rendering of a plan proposed by the city for bike lanes along the bridge. The idea met with opposition and was discarded. Officials told the Statesman the lanes would be in place by this spring to accommodate a huge increase in hike and bike traffic from the boardwalk. But the city has reversed course on that project. Alexander says much of that community feedback came during public outreach for the Holly Shores Master Plan. A proposed pedestrian bridge further west faced opposition from neighborhood groups during that same process. Now, officials with the transportation department say they’re not ready to go public with other suggestions right now, though they are welcoming suggestions. Christopher Stanton, who serves on the city’s bike advisory committee, has already offered one. He runs the Ghisallo Foundation, a nonprofit that promotes biking among kids. He knows the hassle of crossing on Pleasant Valley first hand. “When we have 14 kids coming across whoever’s on the other side has to wait for a very long time," he says with a laugh. Stanton's idea is to create a new bridge across the lake that would run as close to the existing bridge as possible. “What we would like to see is kind of a lake-level bridge. Like a floating bridge like they have in Portland, or another thing similar to the boardwalk," he says. Once a plan is finalized it still needs to be funded –meaning a long-term solution to the bottleneck is probably years away. The boardwalk along Lady Bird Lake in Austin opens tomorrow. The Lady Bird Lake Boardwalk is set to open to the public on June 7. The 1.3 mile boardwalk will complete a ten-mile loop of trail around the lake. Howard Lazarus with Austin’s Public Works Department says the boardwalk will play a key role in expanding biking and pedestrian options throughout the region. The City of Austin will host a walking tour of the south shore of Lady Bird Lake tomorrow to get public input on future development along the shore from Auditorium Shores to the area near I-35. The tour of the roughly 100-acre strip is open to the public and will feature a dozen experts on development, cultural and environmental issues that could arise over the next 20 to 30 years of development. Alan Holt, a planner with the Planning and Development Review Department, says the tour will begin a long process of public outreach as the area develops, but that it will also highlight connectivity issues that won't necessarily be mitigated by the boardwalk project, which is nearing completion. "Right now, if you would walk down to the shore, or to the lake or to the boardwalk, you have to hop fences to get into gated communities to do that, or walk through acres and acres of parking lots," Holt says.